What are the origins of Reflexology? This question remains to this day. Could it be an archetypal form of therapy found everywhere in the world? That is what I think. As Christine Issel writes in her very interesting book: Reflexology: Art, Science & History « no one culture can claim to have “discovered” reflexology because different forms of working on the feet to effect health have been used by people all over the world since the beginning of time. » Examples of foot work in the form of pictures or statues have been found in India, Japan, China and Europe but no written documentation has yet been discovered. The oldest documentation that could be interpreted as depicting the use of reflexology is found in Egypt, in the towns of Giza and Saqqara. In Saqqara, in the tomb of the highest official after the Pharaoh, the physician Ankhmahor, we find carved on one of the six walls, a scene representing a practice of reflexology. “ Do so it will give strength anew ”. Comment: this sentence comes from the patient who complains of his weakened hand, wishing that care provided by the doctor will bring his strength back. “ I do as you please, (ô) Lord ”. Comment: practitioner’s response according to a common formula. “ Do not let it be painful ”. Comment: the patient seems to be afraid that the doctor hurts his toes. It is thanks to Hanne Marquard*, a well-known German reflexologist, her 50 years of experience in this field, and to this pictogram (beside) that, as of 2006, my comprehension of Reflexology took a new dimension, bringing more vibrance, resonance and meaning into my practice. Since then, when someone comes in for a reflexology treatment, I have become more conscientious of the fact that not only I am holding the person’s feet/heel in the palms of my hands but also in actuality, holding the person’s being – their essence. Imagine holding the person – the being and not just their feet. Is it not what the pictogram reveals? Hanne Marquardt has allowed me to comprehend Reflexology in a rather unique manner. Here is the uniqueness. When the pictogram is swiveled 90 degrees, a second form takes shape within the pictogram. Do you see it opposite the text ? 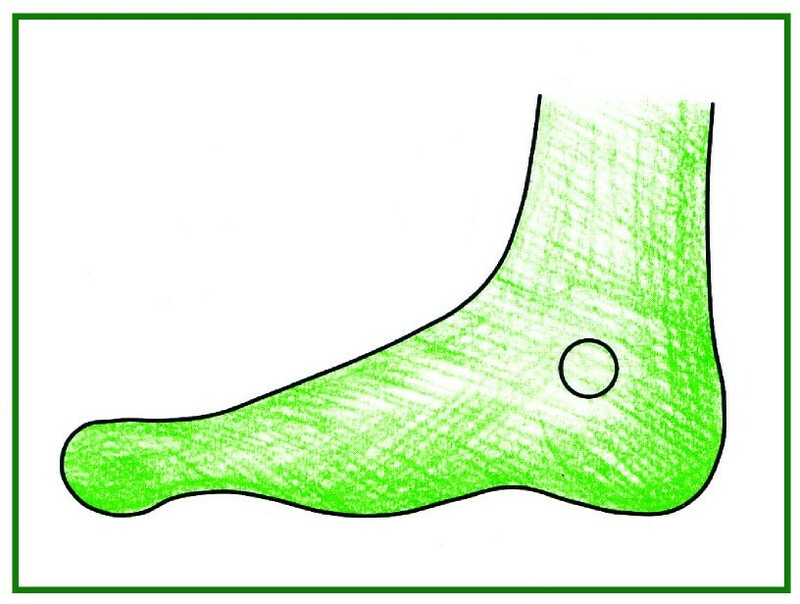 This relationship of the foot – and that of a sitting person is based on the idea that the foot is a micro system of a macro system, called the body of a person and on the similarity in shape. In her amazing and very enriching book called Reflexotherapy of the feet, Hanne Marquardt writes: “the term reflexotherapy is commonly used to describe a reflection of the whole in its parts”. Let’s take another and maybe more familiar example: Auriculotherapy. This method, according to Paul Nogier, is based on the similarity in shape of an embryo and the outer ear. Do you recognize the similarities in the outlines formed in these two drawings ? Let’s look a little closer at the above pictogram; we are discovering a similarity in shape between a sitting person and a foot. Seen in its upright position, It is an outline of a person in a sitting position within the outline of the shape of the foot that gets revealed. And in its horizontal position, it is the anatomical shape of the foot that appears. Incredible, is it not ? 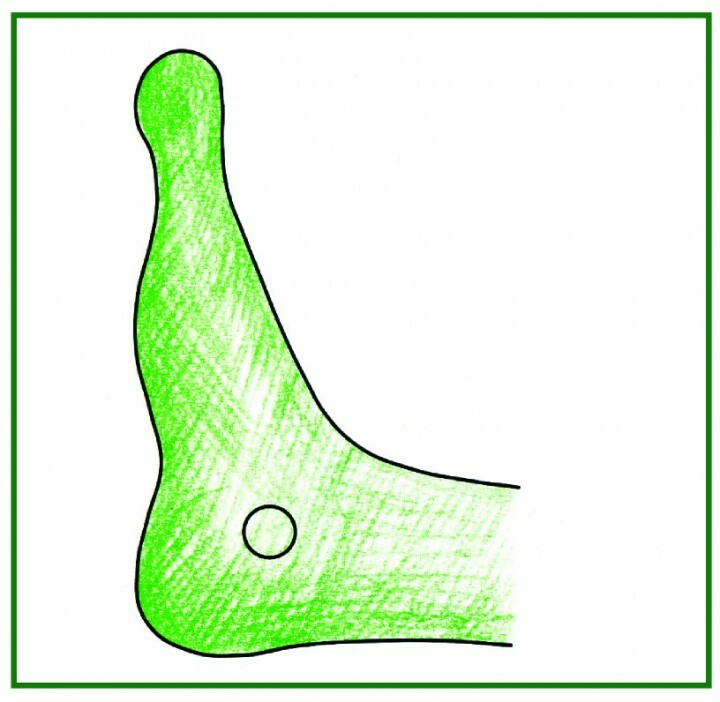 Please take time to play and get familiar with this pictogram: a vision of a sitting person revealed in an upright foot which when turned 90 degrees horizontally reveals the shape of a foot. As this concept becomes clearer, one can recognize the many similarities in shape that unfolds. Let’s view them together. the head and neck of a person correspond to the toes. the abdomen and pelvis of a person correspond to the tarsal bones. the thighs of a person correspond to the distal parts of the legs. The skeleton of the feet – made of 26 bones – is like a map, a reliable canvas, where it becomes very easy to localize with precision the different areas in the feet. Ever since I use this map in my practice, I feel much more confidant, accurate and precise. It has also helped me not to confuse the map with the territory. The map is not the territory said Alfred Korzybski (1879 –1950). This map acts as a safeguard and allows me to be and stay present with the territory – which is to say – link in with the person as a whole throughout the session. It allows me to tune in and listen to what the person, through her feet, unveils and reveals. Thanks to this map, it is much easier to stay connected with the “Intelligence” of the person’s body with whom I am in contact with via the feet and all the while feeling “Life” animating the person. “Health is never lost” says Dr Rollin Becker. These words are at the heart of my work when I meet and accompany a person during the session. Once the treatment has been completed, I, also, have noticed that the person feels more whole, more serene, and much more vibrant. * Hanne Marquardt, born in 1933 in Germany, trained as a State Registered Nurse in England, Naturopath, experienced reflexologist, has been training therapists in Reflexotherapy of the Feet in the main school for RFT in Königsfeld-Burgberg, in Germany for over 50 years. As of today, 15 training centers have been established in Germany and abroad. She lectures on Reflexotherapy of the Feet all around the world. Reflexology Marine Augustin-Normand is proudly powered by WordPress and BuddyPress. Just another WordPress Theme by Themekraft.